In the complicated and highly technical world of cardiovascular surgery, every detail is key – from the care the patient receives pre and post operation to the decision-making undergone in the operating room. Thanks to the effort and expertise they demonstrate at every turn in the process, Western Maryland Health System’s cardiac program hit another benchmark recently, as the team marked another year with zero mortalities 30 days post-operation in 2018. Even with a year of no mortalities, the team is always striving for improvement. They measure the amount of conditions like wound infections and strokes, as well as other metrics such as post-operative length of stay, time on the ventilator, and the type and amount of medication issued. “We review all of this quarterly and make sure we are within the parameters compared with the rest of our area and the country. We always do very well,” Dr. Nelson said. The program also marked zero cerebrovascular accidents (strokes) in 2018. 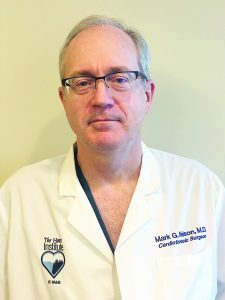 “Quality care and outcomes are key focus areas for the cardiac program and our close involvement with the Maryland Cardiac Surgery Quality Initiative along with benchmarking our data with the Society of Thoracic Surgery nationally ensures we maintain a strong quality focus and continually strive to improve,” Ruhl said. Just before the mortality results were announced, the WMHS cardiac program was also recognized for the fifth consecutive year with the Cardiac Surgery Excellence Award by Healthgrades, which honors the health system for being the in the top 10 percent for cardiac surgery among hospitals in the nation.